Home Hillary For America Volunteer Hillary : "Are You With Me Tonight" ? Hillary : "Are You With Me Tonight" ? 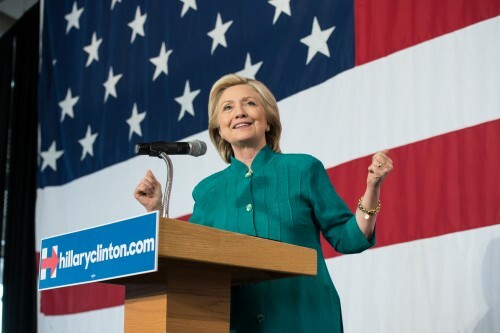 Photo and Copyright By Barbara Kinney/Hillary for America. In the summer of 1995, she walked onto a stage in Beijing, and declared that women’s rights were human rights, and human rights were women’s rights. Tonight, in the fall of 2016, Hillary’s going to take the stage once more, this time at Hofstra University -- this time with more eyes on her and more on the line than ever before. I know Hillary. And I know that tonight, she is going to stand up for the same ideas and ideals she’s been fighting for her entire life. Once more, she’ll tell us that we need to reject the hate we’re hearing and rise above others’ attempts to divide us. That our country will only truly thrive when every citizen has the opportunity to succeed. With tens of millions of people tuning in, this debate will define the final six weeks of this race. And even after so many years on so many stages, I know how much it will mean for Hillary to hear how many people were cheering her on tonight. We’re looking for 43,669 more supporters to join our team and become Debate Donors before the big event -- can you chip in right now to prove that you have Hillary’s back as she shows the world what a resilient, brilliant president she’ll be? I’m about to head onstage to take on Donald Trump in our first presidential debate. I hope I show that I will never stop fighting for you or the people you love. But I need you with me. Your contribution right now is about much more than money -- it shows that no matter how hard this race gets, you’ll still be there for me. No matter what happens when Hillary debates Donald Trump tonight, this race is going to be different tomorrow morning. That’s why Hillary needs to know if you’re with her -- and she needs to know right now, before the debate begins. We’re counting on 14 more supporters from your area to be official Debate Donors -- we’re trying to hit 100,000 before she heads on stage. We’re 52 percent of the way there -- will you be one of them and help hit this goal? Whatever Trump does tonight, it’s clear that his team has his back. They’ve stepped up in recent weeks and made their voices heard. Polls are tighter, his fundraising is surging, and he’s going to walk on that stage tonight with momentum on his side. How do you want to answer him? Do you want to be someone who stands on the sidelines while Hillary fights tooth-and-nail against this bully, or are you someone who stands right next to her when she needs you the most? It’s up to each and every one of us right now to make that call. There’s only going to be one first debate. And whether we step up to say that we’re on Hillary’s team -- that love trumps hate and hope defeats fear -- could make the difference come November 8th. This is your country. Hillary’s fighting for it. Will you fight for her? What you can do tonight?